The combination of spices in this recipe will work well with chicken as it did for the pork tenderloin. I would recommend marinating the pork (or chicken) overnight so the flavor really gets into the meat. It makes a world of difference to have all that spice in every bite! 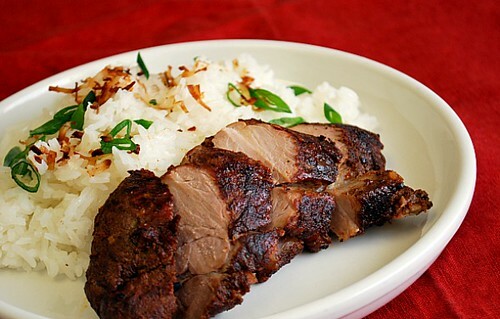 I served this with toasted coconut rice (recipe follows) to complete the island inspired meal. To prepare pork, combine first 13 ingredients in a blender; process until smooth. Place green onion mixture in a large zip-top bag. Add pork to bag; seal. Marinate in refrigerator 8 hours or overnight, turning occasionally. Heat oil in a saucepan over medium heat. Cook coconut, stirring, until golden brown, about 6 minutes. Set aside 2 tablespoons coconut. Stir rice into pan with remaining coconut. Add water and salt, and bring to a boil. Reduce heat, and simmer, covered, until water is absorbed and rice is tender, about 20 minutes. Garnish with reserved coconut and the scallions.